At Middletown Fire Company, we strive to educate the public and youth of Middletown Township about the dangers of fire and fire safety. MIddletown Fire Company No.1's Fire Prevention Coordinators are Virginia Gaeta and Township Fire Marshal Al Mancill. Both of these members are dedicated to the cause of fire-prevention education and are looking forward to a productive year! 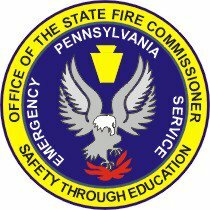 The Fire Prevention Committee will begin planning their course for the coming year to include our Fire Prevention Presentations and Annual Middletown Fire Company Thrill Show (held every October). Last year, they made presentations at most of the township's schools/day cares and they plan a repeat for this year. If you have a group who would like to visit the fire company and learn a little of what we are all about, please call 610-566-0723 and ask to speak to company officer. FIRE SAFETY AND PREVENTION BEGINS IN THE HOME!